Old railroad overpass bridge on its last day in its former location. 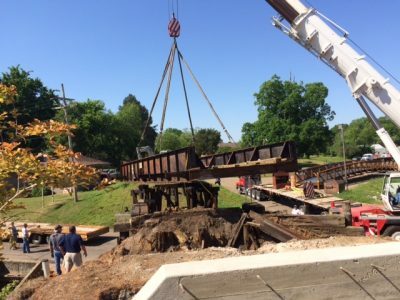 A railroad bridge in downtown New Albany, believed to have been built more than 100 years ago, was removed in one piece Wednesday morning, May 6. The bridge formerly carried trains of the old Ship Island, Ripley and Kentucky Railroad, a company originally chartered as the Ripley Railroad in 1874 by Colonel William Clark Falkner, a great-grandfather of the 20th century novelist William Cuthbert Faulkner. The bridge was fabricated on-site of steel and gray iron and rested on a foundation of large creosote-treated timbers. Old railroad bridge lifted from its foundation. The railroad went through numerous name changes and changes of ownership in the 141 years since it was founded. It is believed the bridge was constructed late in the 19th century by owners who converted the tracks to “standard gauge,” meaning a distance between the inside edges of the rails of 4 feet 8-1/2 inches. The portion of the tracks running from New Albany to Houston, MS, a little more than 43 miles, was abandoned by the railroad operator in 2004. The abandoned railroad right of way was used to construct the Tanglefoot Trail, a cycling and hiking trail with its New Albany trailhead about 200 feet north of the old bridge. The trail opened in 2014. Clerance being lifted out, the replacement visible behind. 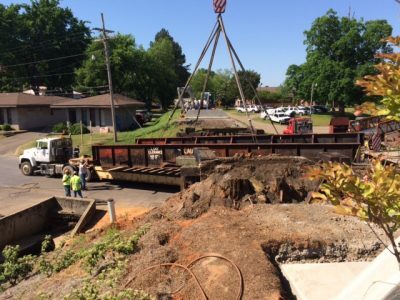 The bridge removed Wednesday morning spanned New Albany’s Main Street, but was too low for large trucks to pass under it. It will be replaced by a 120-foot-long all steel arched bridge, fabricated elsewhere and delivered in two pieces to New Albany last month. Retiring bridge being moved toward truck. 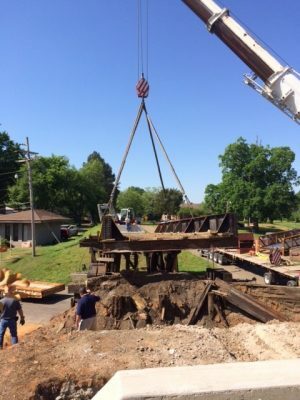 Paul Smithey Construction Company of Tupelo is in charge of the project and expects to install the fully assembled new bridge on recently built concrete pilings tomorrow, Thursday, May 7. When the arched bridge with its north and south approaches is completed it will carry the growing traffic of cyclists and hikers on the Tanglefoot Trail, and will be high enough for large trucks to pass beneath it. Does John McCain’s death signal the end of the old Republican Party? This is ridiculous. Is there a lot of high-clearance truck traffic required there? Why not leave a little bit of railroad history intact? And no need to counter with bike promo stuff. I’m a 35-time triathlete and clearly understand that end of it. Also guessing this transformation was not free of charge. I worked at Union Planters Bank, located near the bridge, for several years. During that time I saw several trucks hit the low railroad bridge. Besides the damage to the trucks the road would be blocked while the trucks were removed. I am happy that a new bridge will be constructed that will allow trucks to pass under it without problem. I always loved the bridge and the railroad tracks running down the middle of the street. The bridge was lettered ‘G.M.& O. R.R.CO.’ for Gulf, Mobile and Ohio Railroad Company. They needed a pole and chains before the bridge to alert the truck drivers.